Penrith halfback Nathan Cleary suffered a knee injury in the side’s 20-18 loss to Canterbury at ANZ Stadium tonight and is set to miss next week’s blockbuster against the Cowboys in Townsville. Cleary suffered the injury – likely to be a medial ligament tear – in the 11th minute but remained on the field for the rest of the first half. Doctors ruled him out of the match during the half-time break. He’ll have scans tomorrow to determine the full extent of the injury. 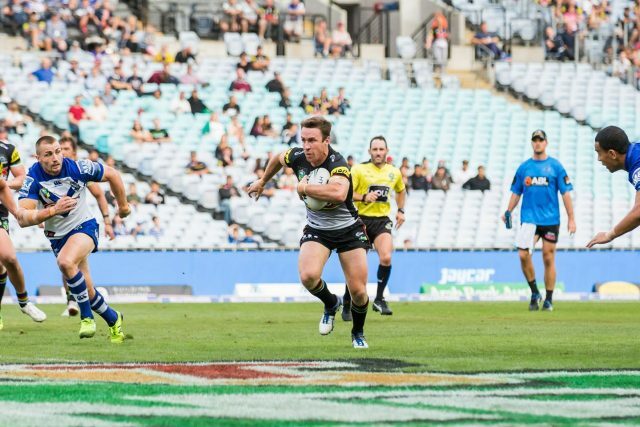 For a third straight week, Penrith fell 14 points behind in the first half before James Maloney scored his first try in Panthers colours to put the visitors back in the game. Down 20-12 at the break, Penrith again defended brilliantly in the second half but without Cleary couldn’t find the points needed to win. They made things interesting with a late Josh Mansour try, but the clock beat them in the end. After the game, coach Anthony Griffin said it was obvious his side needed to fix their slow starts. But he also questioned a controversial video referee call in the first half, in which a Bulldogs try was awarded despite what appeared to be clear evidence of James Maloney being impeded.